Details about Large Cat Tapeworm Dewormer - 5 to 30 Capsules (doses) You choose quantity! 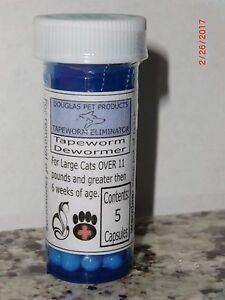 Large Cat Tapeworm Dewormer - 5 to 30 Capsules (doses) You choose quantity! Will usually send within same business day if paid before 01:00 SGT (excludes weekends and holidays). Expected post time may vary and is based on seller's order cut-off time. Please make sure your shipping address is correct while you're at checkout. I can not change the shipping address once the label has been printed.